[Unpad.ac.id, 23/11/2016] Professor of the Faculty of Mathematics and Natural Sciences (FMIPA), Universitas Padjadjaran, Prof. Dr. Toto Subroto, M.S., received research grant from European Union (EU) Agency. This grant was obtained through strategic research cooperation in biotechnology, bioinformatics, and molecular modeling incorporated in EU Consortium. EU Consortium is a commission of inter-European countries in EU Agency. Aspects of research and innovation is one of the specific field of study into the activities of the EU Agency. The consortium is coordinated by Prof. Jean-Luc Mouget from Université du Maine (UM), France, involving about 20 partner institutions from countries in the region Europe, Canada, USA, and Indonesia. Prof. Toto said that the grant was obtained for the cooperation that has been built between Unpad and Université du Maine. From one of these grants, Prof. Toto received a funding of 117,000 Euros, or approximately USD 1.7 billion. Prof. Toto partnered directly with UM through a network of one of the alumni of the Faculty of Fisheries and Marine Padjadjaran, Fiddy Semba Prasteya, PhD. “This grant will greatly affect the strengthening of research activity,” said Prof. Toto when interviewed by electronic mail. 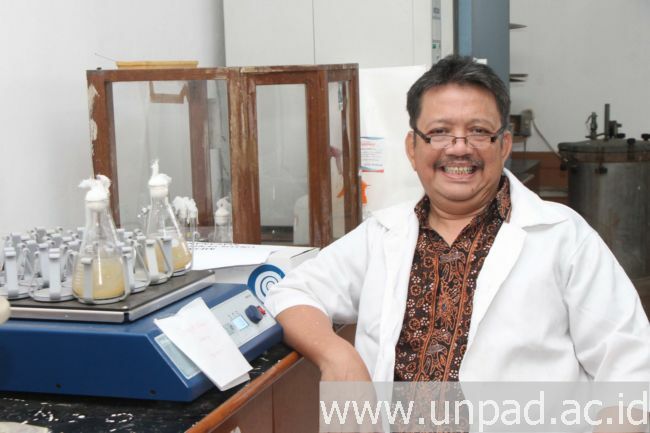 Further, this Professor born in Kuningan September 1, 1959, explained that the project is done through EU grants Consortium related to a project entitled “Ghana, or The Genus Haslea, New marine resources for technology blue and Aquaculture. This project aims to explore simultaneously characterizing the living marine resources of new (new marine bioresource) for applications in the field of aquaculture blue biotechnology, cosmetics, food, and health aspects. This project, too, said Prof. Toto, will learn a variety of biological and chemical diversity of Haslea ostrearia and pigmen marennine diatoms along with pigments and other bioactive compounds produced. As project coordinator, Prof. Jean-Luc Mouget, a lecturer who study the field of microalgae biotechnology specifics about diatoms, particularly species Haslea ostrearia. He pursued his research on this species for 15 years and has been produced many publication about Haslea ostrearia and pigmen marennine diatoms. The molecular structure of the pigmen marennine definitely produced by species Haslea ostrearia until today. However, one researcher from the Department of Chemistry, Universitas Padjadjaran, Muhammad Yusuf, PhD, who also belong to this project managed to find application in the field of health pigmen marennine studied through molecular computation and modeling approach. By contributing in one of the world research projects, this holder of graduate degree program of Biochemistry ITB said, Unpad is able to optimize a variety of potential marine resources Indonesia. “As one of the biodiversity hotspots in the world, it would be a pity if it is not used optimally,” he added. Prof. Toto himself led the Research and Development Center for Molecular Biotechnology and Bioinformatics Padjadjaran, so this research grant is also a move to establish a study center on the world stage research in Indonesia. The grant also encouraged the increase of cooperation in order to realize Unpad institutions as the World Class University. Prof. Toto is optimistic there will be cooperation to provide double degree programs, staff exchanges, up to expected to increase the capacity of scientific researchers involved. “With the grant, it will also affect the institutions not only in biotechnology research, but also an increase in other research and educational cooperation, as well as international publications,” explained Prof. Toto. Prof. Toto together with other researchers have produced a variety of downstream products featured in partnership with industry and agencies. The first product that is Thrombirec used as Fibrin Glue to affix the tissue without a stitch in the eye or other tissue post surgery, to reduce the traumatic patients against the use of sutures. This product is partnered with the National Eye Centre Cicendo Eye Hospital, Bandung.